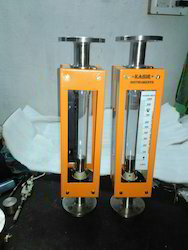 “KABIR” manufactures Variable Area Flowmeters (Rotameters) which are mainly used for Liquid & Gas applications for measurement of Rate of Flow indication. The Float moves up & down in the tapered Borosilicate Glass Tube with fluid flow from bottom to top. The Float takes up a position where buoyancy forces and the float weight are balanced in proportion to flow rate. The vertical position of the float as indicated by scale is the measure of the instantaneous flow rate. 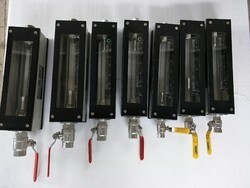 KABIR” make Acrylic Body Rotameters are mainly used for Water / Salt Water, Air, Nitrogen, Hydrogen, Natural Gas application. These are integrally machined cut in acrylic body from imported transparent acrylic blocks sheets. These are also suited with flanged or screwed connections and several options of material for the wetted parts. All our products are developed as per industry norms, using premium raw material and latest technology. Metering Tube : Solid Acrylic Block. Body : Imported transparent acrylic block. 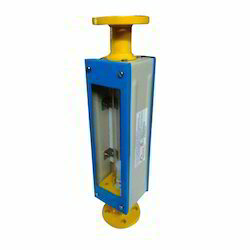 Accessories : High & low flow alarms and 4-20 mA output on your request. 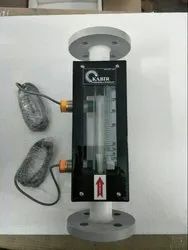 “KABIR” manufactures Glass Tube Rotameter or Variable Area Flowmeters (Rotameters) which are mainly used for Liquid & Gas applications for measurement of Rate of Flow indication. The Float moves up & down in the tapered Borosilicate Glass Tube with fluid flow from bottom to top. The Float takes up a position where buoyancy forces and the float weight are balanced in proportion to flow rate. The vertical position of the float as indicated by scale is the measure of the instantaneous flow rate. End fittings: - MS, CS, SS304, SS316, CF8M, CF8,C.I. PTFE lined, C.I. SS lined, PVC and any other desired material subject to its Availability. Float:- SS 316, PTFE and other on request. Packing:- Neoprene, PTFE, Silicon, Viton. Frame & Cover :- MS, Optionally SS. Accuracy :- +/- 2% F.S.D. 93º C for Liquid services. Looking for Glass Tube Rotameter ?